The images produced by the New Horizon’s flyby of Pluto can be considered as part the long history of popularizing astronomical knowledge with photographs. 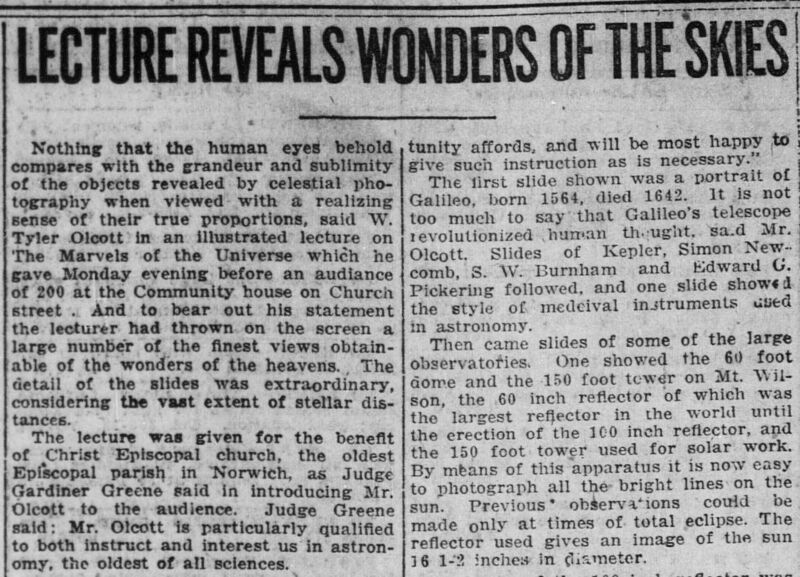 On November 30, 1920, the Norwich Bulletin reported on “The Marvels of the Universe,” an illustrated lecture by William Tyler Olcott that reportedly enthralled the 200-person audience at the Community House on Church St. Olcott was an amateur astronomer who had been given encouragement by the director of the Harvard College Observatory. He was important to the founding, in 1911, of the American Association of Variable Star Observers (http://www.aavso.org/emergence-founding-and-growth). 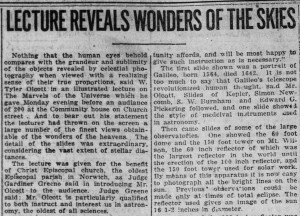 The growth of amateur astronomy was an integral part of the growth of American astronomy, as amateurs developed a relationship with professionals and a division of labor in which amateurs provided reliable data for the professionals to interpret (Lankford, p. 376). Olcott reportedly concluded his Norwich lecture, however, on a more philosophical note. “If you have viewed these wonderful sights in the proper attitude, you will have sensed the greatest thought presented to human minds.” The full article can be viewed on Chronicling America . “The Emergence, Founding, and Growth of the AAVSO,” http://www.aavso.org/emergence-founding-and-growth. Accessed July 15, 2015. Lankford, John and Rickly L. Slavings, American Astronomy: Community, Careers, and Power, 1859-1940. Chicago, University of Chicago Press, 1997.